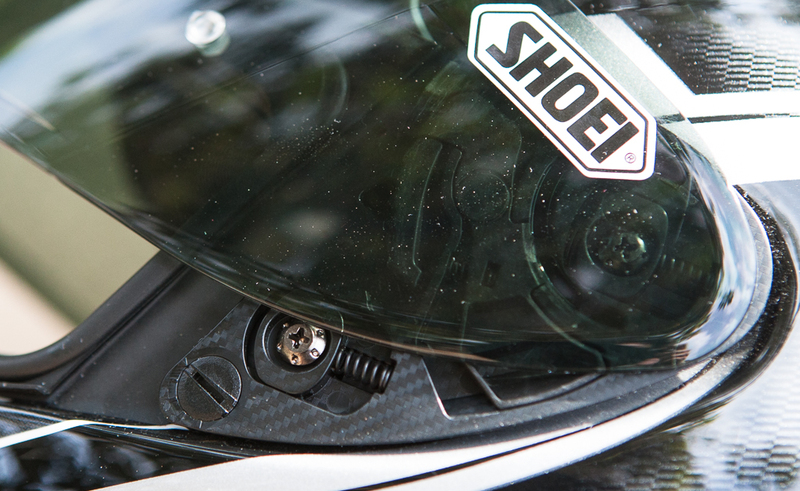 Way back in October, we previewed Shoei’s RF–1200 while we waited for our samples to arrive stateside. 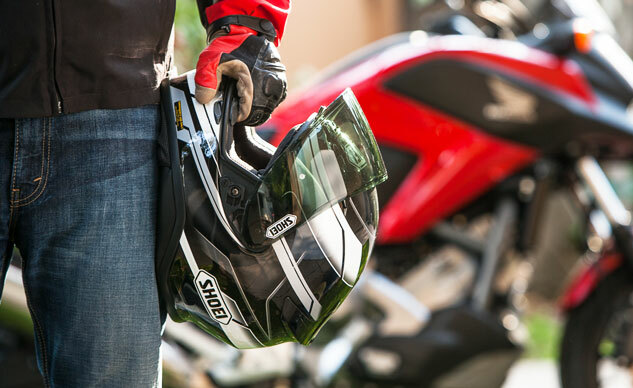 Well, we’ve logged a couple thousand miles with Shoei’s latest lid and can offer a full review. Folks who’ve loved the RF series of Shoei helmets in the past will be happy to know that the fit is still the same. If you have an oval head, the new RF will feel instantly comfortable. While your noggin may tell you the helmet feels similar to past models, your hands will tell you another story as you don and doff the helmet. The shell itself feels more appropriately proportioned to the head size it is slated to fit which is most likely the result of the four shell sizes. With each shell supporting a smaller number of sizes, the tolerances can be tightened between the shell and the liner. Aside from the Mystify TC–5 (left) and the Dominance TC-2 (right) tested, the RF-1200 is offered in four additional graphic styles and nine solid colors. Both Duke and I have long-oval shaped heads, and the RF-1200 fit without the fore and aft hot spots often experienced with our head shape. Similarly, the side-to-side fit is comfortably close without any gaps to allow in noise. Both testers described the fit as “snug” but comfortable. Visually, the bottom of the RF-1200 is not very different from the RF-1100, but subtle changes result in a quieter helmet. The chin curtain reduces noise further. Shoei’s work in reducing helmet noise shows with the RF-1200. The smaller opening and closer fitting comfort padding around the rider’s ears helps muffle the wind noise that emanates from the helmet base. The included chin curtain reduces the sound a tad further but at the expense of ventilation around a rider’s mouth. The chin curtain also makes the helmet warmer on chilly days. The improved aerodynamics that Shoei stressed in its press materials are apparent at speed. In a clean airstream, the buffeting around the lower portion of the helmet is reduced compared to previous RFs. “The RF glides smoothly through the air, even when tipped sideways at highway speeds while shoulder-checking,” notes Duke. Although the 1200’s aerodynamics do play an important role in the reduced noise reaching the rider’s ears, don’t let this fool you into thinking that earplugs will not be necessary when riding on the highway. No helmet we’ve tested prevents harmful noise from reaching ears while traveling at highway speeds. The RF-1200’s venting is decent if not excellent. The new visor, with its top and bottom supporting ribs, helped to increase the rigidity of the plastic when raising or lowering the shield. However, the stiff detents in the opening range occasionally caused the visor to flex and refuse to rotate. Making sure to not apply any side force but, rather, straight up and down force to the visor prevents the flex. The eye port covered by the visor is spacious without any obstruction to the rider’s vision. The adjustable screws on the faceshield’s mounting hardware makes fine tuning the visor’s seal a breeze (or a distinct lack of it). Swapping visors is as easy as we’ve come to expect from Shoei. The helmet’s ratcheting mechanism makes sure the visor stays in the selected position at speed. However, it sometimes makes the visor difficult to close. 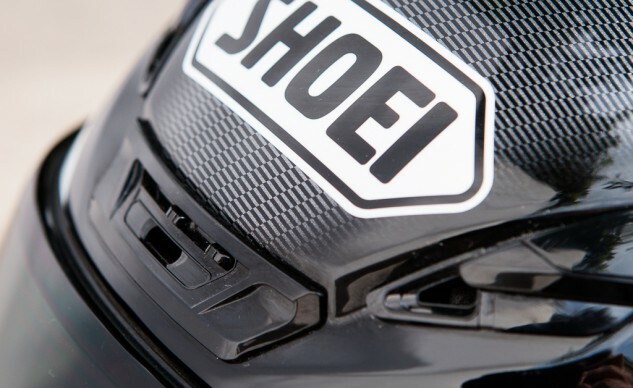 Shoei’s reputation as a top-shelf manufacturer is more than held up by the RF-1200’s quality of contruction. 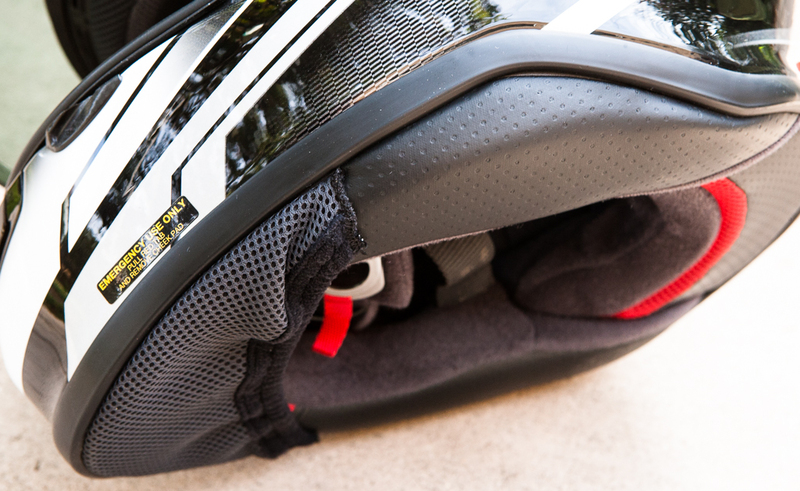 Details, like the washable, removable liner, assure that owners will get the most use out of their helmet abound. Similarly, where other manufacturers might think the visor seal was good enough, the RF-1200 forms an air-tight seal that you can fine-tune, as mentioned above. Finally, the surface finish of the clear coat and design are top notch with the transition between graphic elements almost imperceptible to the finger. Riders who live in wet or cold environments will appreciate the included clear Pinlock anti-fog visor shield. Although Shoei recommends against riding at night with the Pinlock installed, my experience is that any trade-off in light transmission is outweighed by the absence of condensation obscuring my vision. 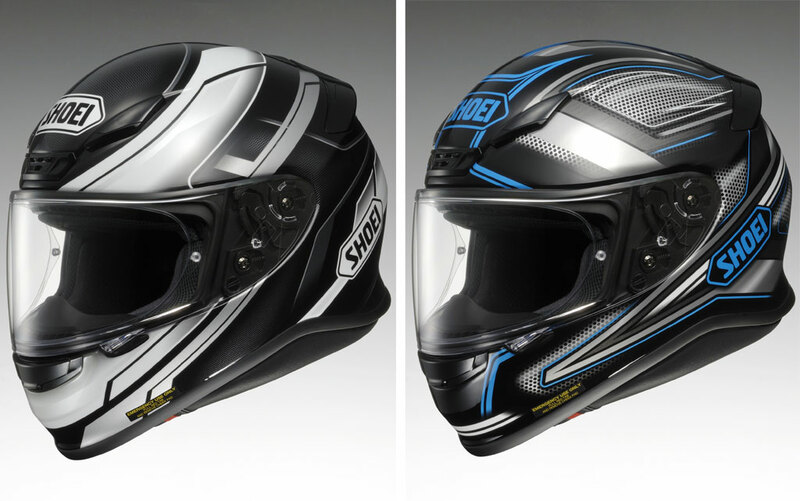 The Shoei RF-1200 is an apt successor to the venerable RF-1100, keeping its utility and premium fit while improving on aerodynamics and quietness. The RF-1200’s MSRP ranges from $485.99 to $589.99, depending on the graphic package, and sizes span from XS-XXL. The RF-1200 comes with a cloth carrying bag, a Pinlock visor, a breath guard, a chin curtain, and silicone seal lubricant. Replacement or tinted visors will set you back $59.99, but Shoei faceshields are traditionally quite tough.